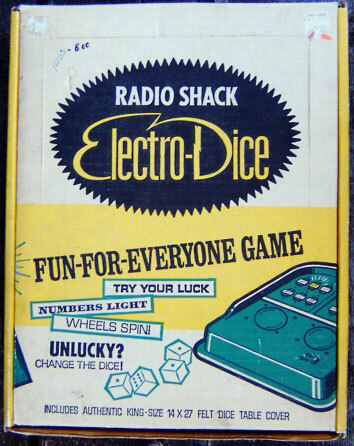 Radio Shack under the ownership of the Tandy Corporation produced some great handheld electronic games during the '80s and beyond. 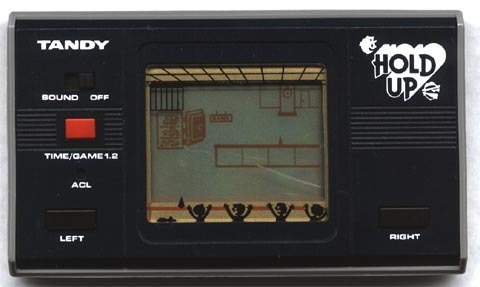 The LCD games were an easy way for kids to get their video game fix in a time when the only other choices were visiting an arcade or begging your parents for a home console like the Atari 2600. Radio Shack seemed to be the hub for electronics and these small LCD games made for great stocking stuffer gifts over the holidays. We were able to play baseball, drive a racecar, or blast aliens anywhere we wanted. While most of the games seemed to have appropriate subject matter, there were several games that are real "head-scratchers" when rediscovered now. 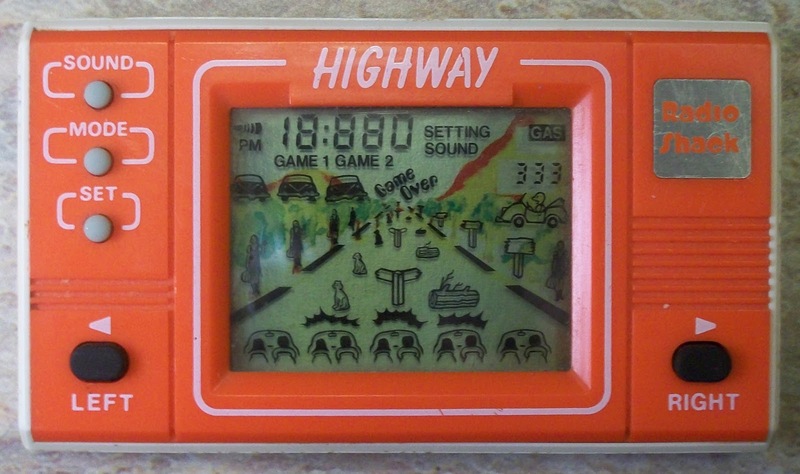 I recently found the Handheld Museum website that showcases hundreds of old electronic games. After looking through some of the Tandy games, I was quite surprised at some of the games I discovered! 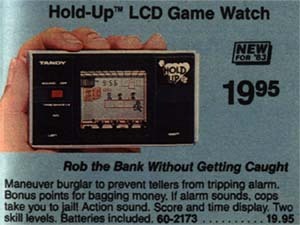 How To Rob A Bank - According to Handheld Museum, "Hold-Up" was the first LCD game offered by Radio Shack and its surprising objective was to rob a bank. While your partner loads the cash, you keep the bank tellers from tripping the alarm by firing warning shots. Seems like a more appropriate plot for a Dirty Harry movie than a handheld game! As you can guess, it was pulled from stores (with refunds even issued) after complaints from parents. How To Beat Blackjack While Checking Your Math Homework - With all the handheld black jack, video poker, and slot machine games released over the years, it's fairly easy to see why we adults can visit an online casino like VegasCasino and know how to play like a pro. 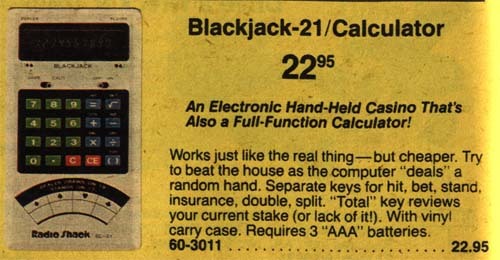 This early "Black Jack-21/Calculator" not only showed us how to bet, but if you were savvy enough, the calculator could help you learn the odds! How To Give Horoscopes While Checking Your Math Homework - Complete with a carrying case, Radio Shack's "Astro" could give daily and natal horoscopes as well as your astrological compatibility with another person. All this while helping you with simple math! The downside is it worked only up until Dec 31, 1999 thanks to Y2K. 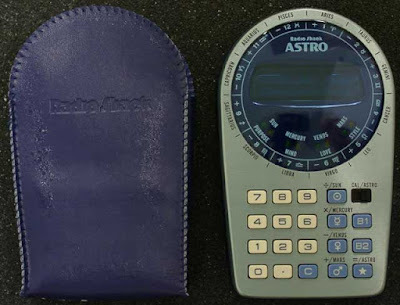 But by that time, if you began using "Astro" from its release in 1979 you probably had already developed a more profitable astrology business than Madam Ruby. 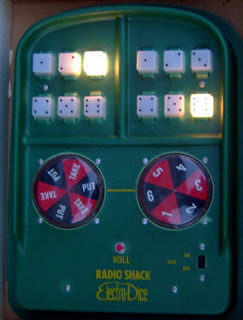 How To Play Craps Without Real Dice - Too sophisticated to roll real dice? Maybe your teacher caught you shooting craps behind the gym again and took your dice. 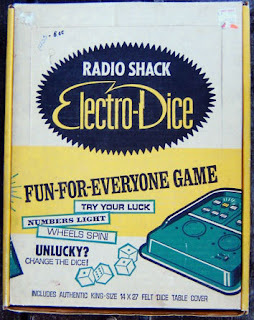 Well, all you had to do was use your winnings and buy "Electro-Dice" at Radio Shack to keep the game going. Even had a felt cover for a real Vegas touch! How To Safely Deliver Hitchhikers To Their Destination - Long before ride share apps like Uber, hitchhiking was an acceptable (and dangerous) practice if you needed transportation. The game "Highway" taught players how to safely deliver a female hitchhiker across the road while avoiding dogs, roadsigns, and rolling logs...you know, a typical driving environment. How To Rescue People From An Active Volcano - "Volcano" was daring adventure against mother nature which used a helicopter with a net to rescue people from an erupting volcano. Of course, this was a great life skill because of all the people who typically inhabit the regions around volcanoes. 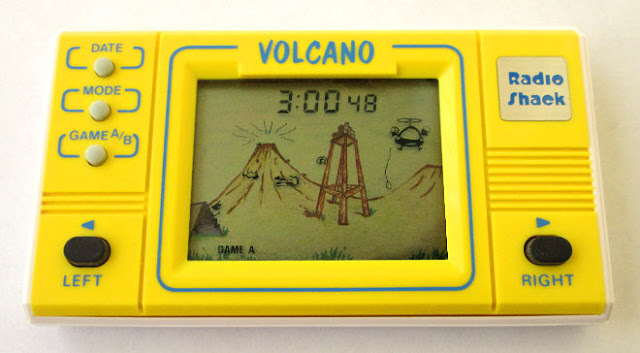 Actually this game might have been helpful since we didn't know how to drive across rivers of lava until the Dante's Peak movie debuted in 1997.